MasterControl Clinical Quality Management System (CQMS) is a holistic Clinical Quality Management Software designed for quality managers that deal with the highly regulated products within the life sciences scope. It’s a complete solution that combines QMS and CTMS to help users manage all activities, documents, processes, project tasks, relationships, quality events, training, and audits that must be implemented in the entire lifecycle of a clinical trial. The platform boosts the reuse and efficiency of information while simplifying tasks and processes to oversee an all-inclusive approach to risk and quality management throughout the clinical trial. MasterControl CQMS is built for businesses of different sizes serving in industries such as lumber, agriculture, plastics, industrial machinery, and pharmaceuticals. Its reliability means that all regulated companies can get products to market faster without inflating the costs or compromising internal efficiency. The program steadily manages the critical information and eliminates the requisite for paper-based processes while adhering to ISO and FDA quality standards. MasterControl CQMS is an innovative Clinical Quality Management System suite built to perform beyond the basic data collection and documentation. It’s a complete and well thought out solution that adopts a holistic approach to manage all the activities involved in the implementation of a clinical trial. The program offers an integrated technique to the management of all the critical data collected from various areas. Its cloud-based or on-premise deployment means it suits businesses operating in a multitude of industries. One aspect of its powerful structure is the TMF project management functionality. This is a reliable feature of this clinical management software engineered to make it easy for clinical project leads to manage processes, task, and even documents of a clinical study. The functionality offers automated task reminders, updates, and milestones as tasks are executed through the lifecycle. In addition, the TMF Reference Model JumpStart configuration ensures you experience no difficult when managing enormous volume of docs that constitute the clinical trial master files. The feature leverages the DIA reference archetype to boost efficiency and provide a unified location for all the TMF documents. Also, MasterControl CQMS makes it easy to transfer high volume batches of data to and from multiple sources including clinical sites, internal, sponsors, and CRO. It provides numerous techniques for importing and exporting content in batch to and from your clinical management system. 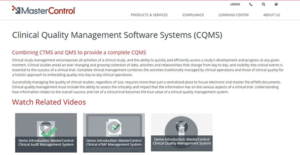 If you are considering MasterControl CQMS it may also be a good idea to examine other subcategories of Best Clinical Trial Management Software collected in our base of SaaS software reviews. Enterprises have different needs and requirements and no software solution can be perfect in such a scenario. It is useless to try to find an ideal off-the-shelf software app that fulfills all your business requirements. The intelligent thing to do would be to adapt the application for your specific needs, employee skill levels, finances, and other aspects. For these reasons, do not hasten and subscribe to well-publicized popular applications. Though these may be widely used, they may not be the perfect fit for your unique requirements. Do your groundwork, look into each short-listed application in detail, read a few MasterControl CQMS reviews, speak to the seller for explanations, and finally select the application that offers what you want. How Much Does MasterControl CQMS Cost? MasterControl CQMS doesn’t publish its enterprise pricing information. Contact the vendor for a detailed pricing info. We realize that when you make a decision to buy Clinical Trial Management Software it’s important not only to see how experts evaluate it in their reviews, but also to find out if the real people and companies that buy it are actually satisfied with the product. That’s why we’ve created our behavior-based Customer Satisfaction Algorithm™ that gathers customer reviews, comments and MasterControl CQMS reviews across a wide range of social media sites. The data is then presented in an easy to digest form showing how many people had positive and negative experience with MasterControl CQMS. With that information at hand you should be equipped to make an informed buying decision that you won’t regret. What are MasterControl CQMS pricing details? What integrations are available for MasterControl CQMS? If you need more information about MasterControl CQMS or you simply have a question let us know what you need and we’ll forward your request directly to the vendor.